HEINE Standard F.O. Laryngoscope Handle with handle shell and battery insert with XHL XENON Technology.Lightweight and convenient.The handle can be powered by either 2.5V batteries or a 3.5V rechargeable battery for even more light. HEINE F.O. handles can be converted from battery to rechargeable specification by exchanging the bottom cap. The Standard F.O. Laryngoscope Handle is also available with Li-ion Technology and Charge Status Display (see below).The handle shell can be sterilized or autoclaved while the battery insert is being charged. 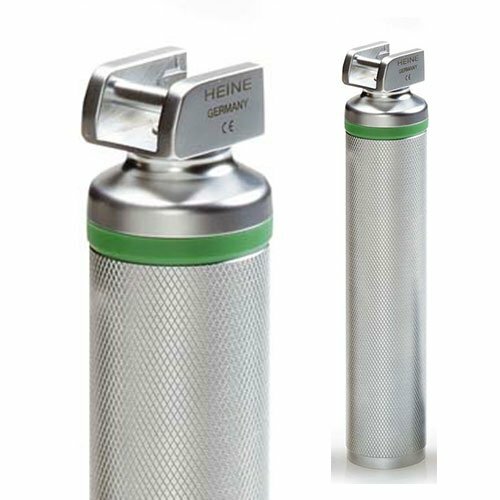 Also compatible with Sterrad and other low-temperature gas plasma sterilisation procedures.Compatible with all blades to the ISO 7376 (green standard).